Spring in Badakhshan can be hauntingly beautiful. Ahmed and I had been traversing Tajikistan's Pamir Mountains for a week in an old Russian jeep when we paused at a juncture in the road to look at our map. I gazed out at the desolation of an almost treeless mountainside-endless rock formations standing in stark contrast to a powder blue sky-whose heights concealed roaring rivers, fertile pastures, and in the lower areas, small orchards. The local people say that when God created the world, he gave everybody something they could use. But by the time Badakhshan's turn came, almost everything had already been distributed, so God gave the Pamiri people rocks and stones. We'd been moving along at a hectic pace, and in that instant, I had the weary sensation of having driven over every boulder, rock, and pebble in those barren hills. Studying the map, Ahmed asked if I wanted to continue along the same road or turn off toward the village of Kuhdeh.1 It was the spring of 1996, and Ahmed and I had been visiting the medical clinics of Badakhshan's Roshtqala District to monitor the distribution of vitamins and polio vaccine. Known as the rooftop of the world, Badakhshan-which borders China to the east, Afghanistan to the southwest, and the Kyrgyz Republic to the northeast-has only 220,000 inhabitants scattered over more than 64,000 square kilometers. Journeys between towns and villages-along some of the bumpiest thoroughfares I have ever encountered-can be formidable. Moreover, we had slept fitfully in our tent the night before, a night that in retrospect was too cold for us to have refused our host's insistence that we sleep indoors. To go to Kuhdeh now surely meant traveling up a valley for an hour only to find another closed health post .2 I looked off the main road and saw what appeared to be a pile of dirt and gravel leading into the river. "There doesn't seem to be a road here," I said. The driver, who had been working in the district for more than twenty-five years, assured me that this was in fact the road to Kuhdeh, adding that it had been washed away. To get there, he said, we would have to cross the river in our jeep. I glanced over at Ahmed, who looked doubtful. If we did not feel like going to Kuhdeh because of the road, I reasoned, perhaps the health workers had not either. So we set out through the river and along ten kilometers of rocky, bone-rattling road. The route at times towered over a deep gorge, and at other points descended to the level of the river. We were later to discover that the people of Kuhdeh had built the road themselves with the help of a neighboring village. As we crossed the river, this time over a worn wooden bridge, we happened upon some farmers and asked if anyone from the medical clinic had come by recently. They laughed and told us that it had been months since any health officials had visited. "Check with Rais [village leader]," they said, "just to make certain." We continued up the road, which ran between small fields bordered on one side by a steep cliff and on the other by a mountain, until we reached the home of the village head. We were met by a lanky, taciturn man who eyed us with skepticism. We introduced ourselves, and he called us into his home to drink shir choi, a local drink made with tea, milk, salt, and sometimes nuts, and to eat bread with sour cream. Light streamed from a central upper window into his single-room Pamiri-style house. I explained that we were there to monitor vaccination coverage and micronutrient distribution for the Aga Khan Foundation and asked about his contact with the health authorities. Like the farmers we had met, he laughed, telling us that our car was the first one that had come to Kuhdeh in almost a year; nobody else had made the effort, not even the nurse at the health post. "They've forgotten us," he said. I later discovered that Kuhdeh had had little assistance since the collapse of the Soviet Union, and that the clothes the villagers wore were, in most cases, the same ones they had owned on the day Tajikistan was forced into independence five years earlier. Rais himself had faced particularly hard times after the Soviet Union collapsed. His brother, after weeks of drinking, had fallen to his death in a ravine not far from his house; Rais had taken his brother's wife and children into his home. I never learned whether he fell or jumped, but Rais always intimated that it had been related to the collapse. Now fourteen people were living under Rais's roof. Despite the difficulties, Rais himself was cautiously optimistic: "Now that the Aga Khan Foundation is here and we're getting food," he would say, "things will be better." As I looked around the village, I desperately wanted to believe him. Our chance turn onto the Kuhdeh road would prove fortuitous for my understanding of Badakhshan. Over the months that followed, I returned to the village dozens of times, and Ahmed and I lived with Rais's family for a few weeks. From countless conversations with people in Kuhdeh and other villages in Badakhshan, I was able to piece together a clearer picture of the myriad ways the collapse of the Soviet Union in 1991 had altered their lives. Although our mission focused on nutrition and vaccination-and later on pharmaceutical drugs-our trips to Kuhdeh and many other villages and towns in Badakhshan allowed us to witness firsthand the transformation of health care in the region from a universal, socialized system to a privatized apparatus guided by the priorities of donors from abroad. From the moment Moscow ceded control over the Soviet Union's vast Central Asian domains, Western governments, development banks, and international NGOs launched a remarkable experiment in privatization and economic liberalization. Some of these interventions have been productive, while others have exacerbated an already precarious situation, primarily for more marginal populations. Various aspects of this evolution-particularly in the banking, petroleum, and consumer goods sectors-have been well documented elsewhere. Relatively little attention has been paid, however, to the delivery of medical care at the village level. In Badakhshan, the situation was even more desperate due to its remoteness and sparse population.14 Winters there are long and extremely severe, making travel almost impossible and leaving the region isolated most of the year. The region had become even more inaccessible with essential supply lines cut because of war: fighting had severed the only road to the rest of Tajikistan. One could still fly to Khorog, Badakhshan's capital-a hair-raising trip on a Soviet-made Yak-40 aircraft, described to me by a seasoned pilot as one of the most harrowing landing approaches in the world-or drive in via Osh in the Kyrgyz Republic through eastern Badakhshan's desolate and sparsely populated Murghab region, a route along the Pamir Highway at more than 3,650 meters (11,975 feet) above sea level. Although many Badakhshanis had been killed during Tajikistan's civil war, the region itself, for the most part, did not suffer much active conflict because of its isolation. This, however, did not stop the influx of more than 60,000 ethnic Pamiri refugees who returned to the relative safety of their ancestral land from other parts of Tajikistan to wait out the war, bringing the population to more than 200,000 souls. Meanwhile, the Soviet state and its complex bureaucracy had stopped functioning, and what local institutional remnants remained were too weak to fill the vacuum. Only after living in the country for an extended period did I come to better understand the degree of shock that had descended on the society after the collapse of the Soviet Union and the ensuing civil war. Their rudder had been destroyed; the surety and security to which they had grown accustomed under Soviet rule had given way to an uncertain future. With the demise of communism, health care and education, once universally available throughout Tajikistan, became scarce. Where the government had once offered a code of ethics and a sense of stability, there was now only deprivation, civil war, and mass upheaval. The government itself had been so weakened by the collapse that in many areas it lacked the wherewithal to run even basic social services. Individuals raised in a world of adequate electricity and food were now forced to live hand to mouth. In places like Badakhshan, which had survived on direct food and fuel shipments from Moscow during the Soviet period, the situation rapidly became dire. By 1993, the humanitarian crisis facing the region left almost the entire population at risk of death from starvation and exposure. It also led to the arrival of a number of international NGOs-including AKF-who, virtually overnight, had to provide the assistance to avert an even greater catastrophe. NGOs stepped into Badakhshan's ravaged landscape with a remarkably expansive and varied mandate. Not only would they provide emergency assistance to citizens at risk of malnutrition and disease, but they were also, de facto, empowered to set up a system for providing Badakhshanis with the crucial social services once delivered by the Soviet state. For me, an anthropology doctoral candidate having finished graduate work in public health, Dr. Claquin's invitation was a remarkable opportunity. AKF had received funding from the U.S. Agency for International Development (USAID) for their food assistance program, as well as an invitation to expand their health programs. USAID, he told me, had also provided funding for a social researcher to work with the foundation to better understand the effects of health care delivery interventions at the community level, specifically in providing pharmaceuticals. After spending two weeks together exploring the health situation in Badakhshan and discussing the pharmaceutical crisis, Dr. Claquin offered me the job. It is very difficult to sugarcoat the collapse of an empire, no matter how bad things may have been before. During moments of reflection, people would describe the hardship they had endured during Soviet times, but it paled in comparison to their post-Soviet predicament. As one woman in Khorog put it, "After the collapse . . . not many changes occurred. Everything is okay. The only problem is starvation." The trauma of the people in Badakhshan, I would find, had implications that extended far beyond the borders of Tajikistan. Many of the changes brought on by the Soviet collapse were linked in subtle ways to broader processes associated with a sudden and relatively unbuffered immersion in the global economy. Using the lens of medical anthropology and combining ethnographic fieldwork, historical research, and social analysis, I hoped to capture a snapshot of rapid political-economic change, set against a backdrop of the collapse of empire, civil war, and the previously unimaginable local presence of NGOs. In the end I focused on pharmaceuticals but could just as easily have studied the distribution of food, clothing, housing, fuel, or other necessities of life, all of which became increasingly subject to larger global processes. For all its poverty and isolation, Badakhshan would yield a rich treasury of ethnographic material on the consequences of abrupt, radical privatization, supported by bilateral and multilateral institutions with mandates largely framed by the discourse of neoliberalism and implemented amid profound social upheaval and transformation. Working with the Aga Khan Foundation placed me in a privileged ethnographic position. On the face of it, the organization was like any large international NGO in the region-a characteristic that ultimately allowed me to use this analysis of one of its many projects as a vehicle for understanding how the ideology of neoliberalism managed to enter the isolated local world of Badakhshan. It is this general attribute of being a large international NGO-in a space where funding is dominated by large global institutions made up of many countries (multilateral funding) and donor agencies representing single countries (bilateral funding)-that I wish to highlight in the pages ahead, and that has allowed me to draw conclusions about how NGOs can inadvertently participate in expanding the penetration of neoliberal ideology globally. It is also relevant to highlight two other significant attributes of the foundation that allowed me to bring into such stark relief the ideological aspect of the program discussed in this book. First, AKF is an organization with a sterling reputation; it operates hundreds of successful programs in many countries. Its efforts have saved many lives and without question have positively contributed to the well-being of many across the globe. The foundation is known for its close connection with the communities in which it operates, involving community members in decision making and modifying programs based on community feedback.19 These characteristics are not only laudable but represent the best of what one imagines to be a strength of nongovernmental development organizations. Second, although AKF is a secular organization, the population of Badakhshan had links to Prince Karim Aga Khan IV, AKF's founder. Most people in Badakhshan are Isma'ili Muslims, a Shi'a denomination that recognizes the Aga Khan as its spiritual leader, or imam. In the final years of the Soviet period, the Badakhshani people reached out to the Aga Khan for assistance. In 1992, after the Soviet Union collapsed and the Tajik civil war started, AKF became involved in providing urgent humanitarian assistance to the region. Starting soon thereafter, and continuing until the late 1990s, the foundation provided three meals a day to Badakhshan's more than 200,000 inhabitants. As an observer midway through this critical period, I can attest that if not for AKF's humanitarian assistance-given in conjunction with efforts by the United Nations World Food Programme, Médecins Sans Frontières, the International Committee of the Red Cross, and the International Federation of the Red Cross-many thousands of Badakhshanis would surely have perished. Together, these distinct attributes could be expected to render AKF's work in Badakhshan relatively immune to external ideological forces like neoliberalism. To expect this, however-to put any organization, no matter how exemplary, on a pedestal-would be to grossly underestimate the power of neoliberal discourse and its ascendant role in defining thought and practice in global health. In fact, my analysis of one particular program instituted in Badakhshan-a revolving drug fund used by numerous NGOs around the world to address shortages of high-quality pharmaceuticals in poor communities-is illustrative of the penetration of neoliberal ideology into the design and implementation of development programs. This penetration is all the more salient in the post-Soviet context, given the roots of neoliberalism as an ideology expressly designed-by individuals who had an open antipathy toward the overarching Soviet model of cradle-to-grave care for citizens-to act as a counterforce to socialism, communism, and totalitarianism. The Bamako Initiative reflected the priorities and worldview of the dominant state and parastatal actors involved in international aid and development, most notably the World Bank and USAID.24 The stated reason for favoring the private sector in providing health care was the belief that "the market" is more efficient in distributing limited health resources.25 Underlying this belief was an ideological commitment to replacing the state with "the market" in allocating essential services. Though the World Bank and USAID are hardly alone in determining health policy in developing countries, their influence-particularly in the newly independent states of the former Soviet Union-has been immense. Having worked closely with AKF during the initial stages of the revolving drug fund in Badakhshan, I understood that this approach was viewed as the only viable means of delivering medicines at a time when humanitarian assistance programs were ending. My sense was that like many NGOs working in the region, the Geneva-based leadership of AKF felt it had to pursue "sustainable" options, especially within a context of great uncertainty, the threat of continued war, a collapsed economy, and reduced international donor funding.26 The approach defined in the Bamako Initiative was seen as a tool that would help the health system transition from "humanitarian assistance" to long-term "development." Anthropologist James Ferguson (1994) has pointed out that the only way to understand such policies is to examine the ideas behind them and to ask what the policies do, what social effects they have, and how they are connected with larger social processes.30 As remote and isolated as Badakhshan remains-geographically, historically, and ethnically-this book aims to show that in a globalized world, culture and space do not exist in isolation. Rather, outside forces decisively shape the cultural space.31 By understanding how the discourse of neoliberalism defined behavior and action on the part of both international NGOs and local actors, we will see that this story about medicines in Badakhshan is not simply one about pharmaceuticals in the post-Soviet period. Rather, it is a story about international development and the dominant discourses that define it. This ethnography is set in the aftermath of the collapse of the Soviet Union, the independence of the Central Asian republics, and the ascension of a world economic order defined by neoliberalism. Foreign NGOs did not create the crisis in Central Asia, Tajikistan, or Badakhshan; that was the product of large-scale social and political forces beyond the control of such institutions. Yet, because of their funding streams, many NGOs working in the region turned to strategies that were not apposite to the place or time. Although we are twenty years from the events of the mid-1990s, that historical moment provides a unique opportunity to study an encounter between a local world shaped by Soviet communism-a centralized economic and social system-and capitalism, which, in its harsh late twentieth-century manifestation as neoliberalism, leaves allocations of resources and services wholly to the market, with the government simply playing an enabling role.41 In part, this encounter is epistemological-related to the nature of knowledge and understanding the world-and in part it is ontological, about the nature of existing or being. It is also moral and political. With the collapse of the Soviet Union, this encounter became one-sided, defined by processes of globalization and the terms and conditions of the regnant world economic order. The facets of this encounter are like pieces of a jigsaw puzzle that, when analyzed together, give us a richer understanding of this moment of transition and its defining features. In part 1, I aim to understand better the first pieces of this puzzle, the milieu in which this encounter took place. Though isolated geographically, Badakhshan was certainly not an ideological wilderness. By the time the Soviet Union collapsed, Moscow had had more than a century of direct involvement in the region, which fell on the boundary of the "great game" between the Russian and British colonial empires. Like most of Central Asia, Badakhshan was a site for Russia's-and later, for Bolshevism's-push for modernity, often manifested in the drive to bring the fruits of modern medicine to the masses. The socioeconomic and ideological structures underpinning these efforts provided a framework for Soviet medical practice, which shaped the delivery of health care in the region until the collapse. Chapter 2 examines health care delivery during the Soviet period, in order to better understand the social context and value system in which the revolving drug fund program was transplanted and implemented. Chapter 3 describes the people of Badakhshan and the arrival of NGOs, particularly AKF, into the region. Part 2 (chapters 4 and 5) examines the impact of the collapse of the Soviet Union on the local Badakhshani population, with a focus on the health situation and the paucity of medicines. It then describes the revolving drug fund as the solution presented to address Badakhshan's pharmaceutical crisis. Part 4 (chapters 8 and 9) examines how the commodification of health care delivery transformed interpersonal relations as well as other sequelae of the revolving drug fund. In the epilogue, I reflect on what ideological penetration of neoliberalism means for current practice in global health. In examining an ideological enterprise-and I hope that by the end of the book the reader will agree that the Bamako Initiative and its revolving drug fund were instruments of neoliberalism-success and failure can be difficult to ascertain. For example, Ferguson (1994) suggests that studying the side effects of a program allows us to speak about a logic that transcends the program being implemented, what many refer to as discourse.47 Thus in Badakhshan what may appear to be a programmatic failure for a NGO (e.g., drugs not reaching patients who need them), may actually be an ideological success for a bilateral donor (e.g., the penetration of neoliberal ideas about the relationship between the citizen and the state into a distant locale). On the flip side of side effects are the programmatic failures that somehow go unexamined. I argue that these are programmatic outcomes that fall into realms of programmatic blindness or, in the case of this analysis, realms of neoliberal programmatic blindness. These are the original aims of projects that get lost or ignored. In the case of global health, a commitment to health delivery-not to mention, as is often the case, a commitment to equity in access and outcomes-requires that we closely examine elements that have fallen into realms of neoliberal programmatic blindness and attempt to remediate such lapses. Describing and enumerating these programmatic elements allows us to examine how discourse has shaped and framed programmatic indicators and outcomes, and more importantly, is a critical first step in the moral and programmatic reorientation of global health interventions. Attempting to describe and analyze any moment of massive social transition-in which the simultaneous forces of nationalism, ethnicity, religious identity, and massive economic and social transformation are all occurring within local social structures increasingly defined by global economic modes of rationality-is difficult. These forces are not all bad: often, they take the form of well-meaning individuals, well-meaning organizations, charities, religious groups, and solidarity groups. Often decisions have been made for purely pragmatic reasons. By focusing on the very narrow program of the revolving drug fund, this ethnography's main aim is to examine how ideology and its instruments can infiltrate development programs and contribute to a situation where important local needs fall into the realms of neoliberal programmatic blindness. It has been eighteen years since I conducted the ethnographic research for this manuscript. In completing this book over the last few years, I have had two worries. The first was a concern that publishing this work would impugn an organization that I both admire and respect. I was worried that it would detract from the hundreds of successful projects that AKF has implemented over the years in so many countries, improving the well-being of many. I also did not want it minimize the difficulty of working in the immediate post-Soviet period in Tajikistan or to diminish in any way efforts that saved the lives of thousands of people in Badakhshan and continue to do so, worldwide, to this day. Over the last decade I have had the opportunity to lead complex health delivery operations in difficult settings, and I know how hard it is to make decisions around funding and operations, especially in times of financial scarcity. In fact, my own feeling is that more than most NGOs, AKF and its partners in the Aga Khan Development Network are sensitive to the needs of the poorer and weaker members of the local population. The fact that they invited me to Badakhshan, funded part of my ethnographic work, and knowingly permitted me to conduct anthropological research from within their organization, with access to all aspects of its programs and projects, is a positive commentary on the desire of the organization for excellence. I learned a great deal from the highly trained local and international staff members working there, some of whom have remained friends over the years. More importantly, the network continued to subsidize pharmaceuticals in the face of the relative failure of the revolving drug fund and remains unstintingly committed to the people of Badakhshan, Tajikistan, and the region. My hope is that readers of this book will be judicious in their assessment of this particular organization-an NGO working in solidarity with a number of poor communities-and save their disapprobation for the main topic of this book, namely the discursive landscape that has led dogma to replace data in shaping and framing the activities of NGOs engaged in global health care delivery and development. My second fear in publishing this book now was that an analysis of neoliberalism's penetration into the post-Soviet world would seem outdated. Sadly, this has not been the case; neoliberalism continues to play an important role in shaping global health care delivery even today. In fact, since the economic collapse of 2008, we have seen neoliberal policies shape the lives of millions around the world, including in Europe and North America, only to see the social, political, economic, and moral effects-and backlash-in real time. Today, we have to be more vigilant than ever. As we think about global health care delivery, we must put those components that fall into realms of neoliberal programmatic blindness-those elements that are not simply about profit and loss but about social cohesion, equity, and a just society-at the forefront of decision making. This ethnography is a case study and a cautionary tale about the forces driving decision making in health and development policy today. Neoliberalism has been the defining paradigm in global health since the latter part of the twentieth century. What started as an untested and unproven theory that the creation of unfettered markets would give rise to political democracy led to policies that promoted the belief that private markets were the optimal agents for the distribution of social goods, including health care. 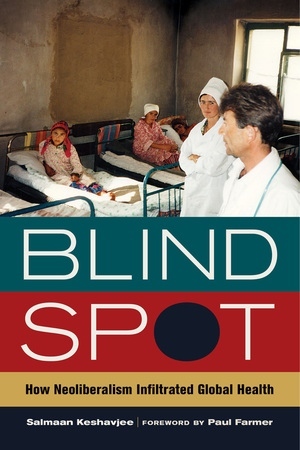 A vivid illustration of the infiltration of neoliberal ideology into the design and implementation of development programs, this case study, set in post-Soviet Tajikistan’s remote eastern province of Badakhshan, draws on extensive ethnographic and historical material to examine a “revolving drug fund” program—used by numerous nongovernmental organizations globally to address shortages of high-quality pharmaceuticals in poor communities. Provocative, rigorous, and accessible, Blind Spot offers a cautionary tale about the forces driving decision making in health and development policy today, illustrating how the privatization of health care can have catastrophic outcomes for some of the world’s most vulnerable populations. Salmaan Keshavjee is a physician and anthropologist with more than two decades of experience working in global health. He is the Director of the Program in Infectious Disease and Social Change in the Department of Global Health at Harvard Medical School, where he is also Associate Professor of Global Health and Social Medicine and Associate Professor of Medicine. He also serves on the faculty of the Division of Global Health Equity (DGHE) at Boston's Brigham and Women's Hospital, and is a physician in the Department of Medicine. Paul Farmer is cofounder of Partners In Health and Chair of the Department of Global Health and Social Medicine at Harvard Medical School. His most recent book is Reimagining Global Health. Other titles include To Repair the World; Pathologies of Power: Health, Human Rights, and the New War on the Poor; Infections and Inequalities: The Modern Plagues; and AIDS and Accusation: Haiti and the Geography of Blame, all by UC Press.